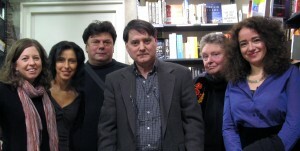 On February 15th, 25 people celebrated Amsterdam Quarterly’s second annual yearbook launch at the American Book Center. The party featured readings by Kate Foley, Bryan Monte, Iclal Akcay, Antonije Nino Zalica, Susan de Sola and Juliet Cutler. The AQ 2012 Yearbook features poetry by Amsterdam residents Iclal Akcay, Madalina Florea and Kate Foley, fiction by Goran Baba Ali and Nino Zalica, and interviews with Kate Foley, Megan M. Garr, Boudewijn Richel and Nina Siegal as well as work by other writers in the Netherlands, the UK, France, the Czech Republic, and the US. Amsterdam Quarterly was founded in April 2011 to publish, promote and comment on English-language writing in Amsterdam, the Netherlands and the world. It is published tri-quarterly online at www.amsterdamquarterly.nl and annually as a print-on-demand anthology. Past issues have included poetry, fiction, memoirs, interviews and drama. Amsterdam Quarterly’s sixth, online issue, AQ6, will be published in mid-April 2013. Its theme is ekphrasis or writing about visual art, music, architecture and dance. It will feature poetry, fiction, a symposium about the new Stedelijk Museum, an interview with Joan Z. Shore, former CBS News Paris correspondent and Huffington Post contributor, and a new category: book reviews. AQ7’s themes will be health and wellness. Send submissions for AQ7 during April 2013 to: submissions@amsterdamquarterly.nl.